For the first time in the NFL's 99-year history, two teams scored 50 points in the same regulation game last month. The Los Angeles Rams' 54-51 victory over the Kansas City Chiefs underscored a season-long explosion of offensive production, a trend that has energized fans and coincided with a notable rise in television ratings. So how did it happen, and why now? 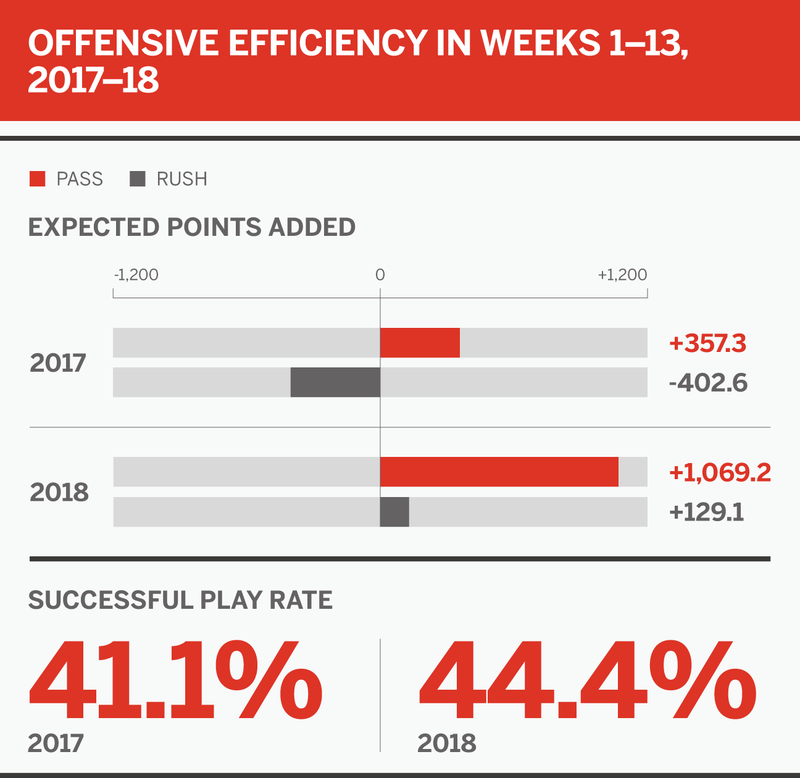 A trip through the numbers reveals a combination of analytics-based playcalling, more rule changes and a fundamental pivot in the use of running backs among the key factors. Let's take a closer look, with figures culled from the ESPN Stats & Information database along with special research from senior statistics analyst Jacob Nitzberg. The spread offense has been decried at the NFL level for years, blamed for everything from poor offensive line play to overuse of the shotgun to a failure to balance playcalling. But in truth, "the spread" is a flexible and generic term for a natural evolution of offense under the current rules. Instead of fighting it, more teams have adopted its elements in measurable ways, contributing to this season's performance. Efficiency is way up, and a 44.4 percent successful play rate -- which marks plays with an EPA greater than zero -- is at the highest mark since our Stats & Information team started tracking it in 2006. Atop the list is an increased use of three-receiver sets, used more often and with better production in 2018 than at any time since ESPN began tracking it. We also are seeing the fruits of the flexibility of movement it gives quarterbacks, who are leaving the pocket more quickly, more often and with more purpose than ever before. In 2018, quarterbacks are spending just 2.22 seconds in the pocket on average, way lower than any other season in the ESPN database, but are taking 2.73 seconds to get a rid of the ball (0.13 seconds higher than any other year). Those quarterbacks who leave the pocket are increasingly following an orchestrated and rehearsed concept. The spread opens up opportunity by giving more options, as completion percentage on such throws is at 52.6 percent, the highest number on record. NFL offenses are setting records through Week 13 in part by owning defenses on first and second downs. Teams are passing more frequently in these situations while getting more bang for their buck when they do run the ball. Overall, teams are averaging 25.7 carries per game, the lowest figure since at least 1932. But yards per carry are way up, an indication playcallers could be doing a better job finding the right run-pass calibration. The numbers are striking. Offenses are averaging 5.8 yards per play on first down, the highest 13-week average in ESPN's data warehouse, which dates to 2001. A matching 5.8-yard average on second down ranks second since then. EPA per play also has spiked on early downs, so it's no surprise that teams are converting first downs 29 percent of the time on early downs, easily the highest rate in ESPN's data set. Whatever is driving offensive success on early downs is not carrying over to third down, when defenses know a pass is coming a very high percentage of the time. Teams are averaging 5.2 yards per play on third down, the third-lowest figure in ESPN's dataset. Other third-down production measures are also in retreat. Sacks are the main reason. Defenses are sacking quarterbacks on 10.7 percent of third-down pass plays. That is the highest rate in ESPN's dataset, evidence that pass-rushers and defensive schemers can win when they know a pass is coming, as they do on third down. But with teams doing so well on early downs, the number of third-down plays per game has fallen to its lowest point in ESPN's data set. The growing gap between production on early downs and third down hints again at the idea that playcallers could be making more optimum choices on first and second downs, when they have the greatest flexibility. Twenty-eight of 32 teams are passing more frequently on first down in the first 28 minutes of games -- eliminating two-minute passing situations and the second half when scoring differential increasingly dictates play selection -- this season over last. The basic takeaway: Teams are passing more when they have the greatest latitude to run. A shift toward using three wide receivers on first down appears to be part of the equation. The percentage of three-receiver sets on first down, usually in the form of 11 personnel with one back and one tight end, has reached 57 percent this season. That is up from around 50 percent through 13 weeks over the past couple of years. Using traditional 11 personnel passing concepts on a traditional running down gives defenses more to think about. While it's tough to say with certainty exactly what is happening, there is no shortage of theories among coaches. "Defensively, everyone is playing single-high on first and second down," Denver Broncos coach Vance Joseph said before the season. "If you have two-back offense and we are in single-high rushing five, you have no chance running the football. Defenses have forced offenses to be more open and create more space on first down because everyone is being more aggressive. Single-high, man coverage, five-man rushers, forcing you to throw the ball outside." "The lanes are bigger," Minnesota Vikings offensive coordinator John DeFilippo said of 11 personnel looks on those early downs. "There's more options in terms of if you go to run/pass kills. If you're going from a run to a pass on the line of scrimmage, depending on the coverage, there's more options for you to get to different things." To reverse an offensive slide in the late 1970s, the NFL introduced the "Mel Blount rule," named for the Hall of Fame cornerback who famously roughed up receivers downfield. The new rule allowed significant contact between receivers and defensive backs only within the first five yards of the line of scrimmage. Now known as illegal contact, the rule had an immediate impact. Passing yards per game increased by 12 percent in 1978, the first season under the new rule, and the upward trend continued for decades. So when scoring dipped in 2017 by nearly 5 percent compared with 2016, the NFL's competition committee didn't look far to find the culprit. 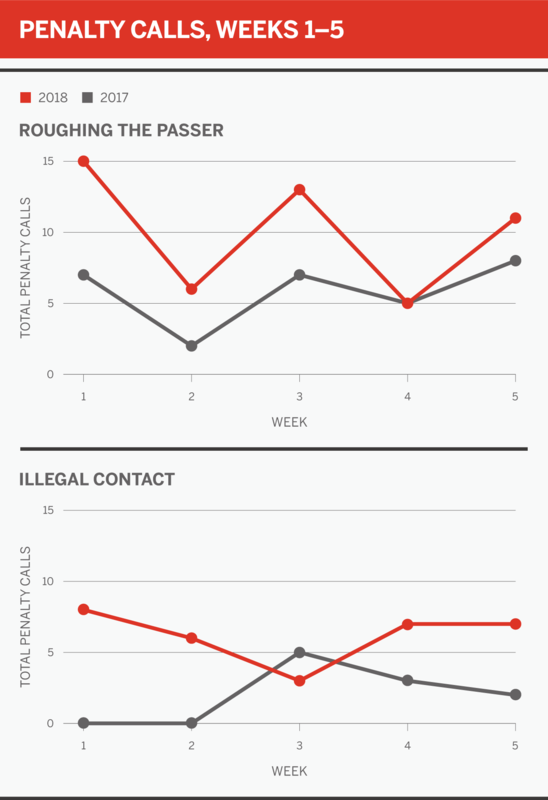 Illegal contact fouls had dropped considerably to 38 over the 256-game season. As recently as 2014, that number was nearly four times higher (146). The committee, chaired by Atlanta Falcons CEO Rich McKay, made illegal contact a point of emphasis for officials, in essence asking them to resume previous standards. Officials responded immediately. They called almost the same number of illegal contact penalties during the first five weeks of the season (31) as they did in the entire 2017 season. Although the pace has dropped a bit since, they established an early tone that required offensive-friendly adjustments from defensive backs. That shift coincided with a major emphasis on player safety rules. The NFL increased early enforcement of roughing the passer (50 in the first five weeks) and introduced a rule that prohibits lowering the helmet to initiate contact. McKay admitted at midseason, "It surprised us how quickly scoring bounced back." He said there was no consensus on why it happened, but when pressed for reasons, the first thing he mentioned was rule changes and emphases. "I think that the illegal contact, defensive holding and adjustments to the use of the helmet have put safeties in a little bit of a different position than they have been in the last couple years," McKay said. Indeed, the NFL has experienced a sharp rise in success rate on passes over the middle, an area once protected by those hard-hitting safeties. With cornerbacks facing more stringent contact enforcement, pass-rushers limited in their contact against quarterbacks with the alterations to the roughing the passer call and safeties threatened with 15-yard penalties for what were considered standard hits just a few years ago, teams are completing 71 percent of their passes between the hashmarks in 2018. That's more than 2 percentage points higher than last season and 7 points higher than the average between 2006-17 (64.1). "When a guy knows he's not going to get blown up, he has another second or a half-second to look the ball in, and he's not going to look away from the football," DeFilippo said. "I do think that has an impact. How much? We'll never know. But I do think it is having an effect." Yards per attempt (8.68), passer rating (101.3) and Total Quarterback Rating (87.1) on passes in the middle of the field are all at record highs. Slight hesitation from the defenders opens up opportunity. Make no mistake. While other factors played into the offensive explosions this season, the rule changes are the most tangible cause. 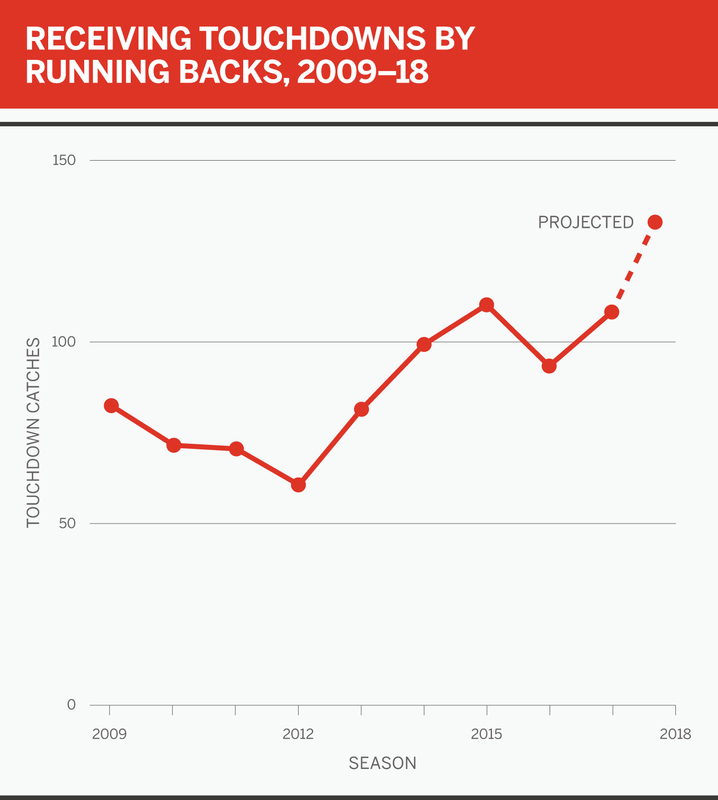 After years of extolling the virtues of pass-catching running backs, from Roger Craig to Marshall Faulk to Brian Westbrook, NFL teams are now stocking their rosters with players of similar skills. Passes in their direction are quick, efficient and, this year, historically productive. To date, running backs are on a pace to shatter the league records in a season for both receptions and touchdown catches. They have caught 77.5 percent of their targeted passes, a rate 12 percentage points higher than receivers and tight ends, and higher than in any full season since at least 2001. Why are teams targeting their backs so frequently, and with such success? In part because quarterbacks are being pressured at a higher rate (29.1 percent) than in any season since at least 2010. The average pass to a running back this season has traveled 0.95 yards past the line of scrimmage. That number is 10.9 yards for receivers and 7.6 yards for tight ends. Quarterbacks feel the pressure, are flushed out of the pocket and look for their running backs. But there also has been an accelerated evolution in identifying and utilizing running backs with receiving skills. Of the five running backs with the most receptions this season, four -- the Panthers' Christian McCaffrey (80), the Giants' Saquon Barkley (74), the Saints' Alvin Kamara (65) and the Bears' Tarik Cohen (59) -- are either rookies or second-year players. That group includes two top-10 draft picks. Some targeting of running backs is dictated by the defense, DeFilippo said. If receivers are covered downfield, or quarterbacks don't have enough time to find them, "there are just going to be some weeks when you have to play the game inside out, instead of outside in," he said. But there is evidence of a new skill level among the current group of backs. In addition to catching a higher rate of targets, they also are averaging 7.97 yards after each catch. That's more than in any season except 2014, a year that Pittsburgh Steelers running back Le'Veon Bell averaged an outlying 10.3 yards per catch. (His career average in all other years has been 7.9 yards per catch.) And these 2018 numbers do not include Bell, who has skipped the season in a contract dispute. A plain truth lies beyond rule changes and scheme trends. The running back position isn't the only one having a direct impact in 2018; there also are more prolific passers on the field this season. NFL teams have thrown 100 additional touchdown passes through Week 13 compared with 2017. The 671 scoring passes are 28 more than the previous record, set in 2015. Indianapolis' Andrew Luck and Kansas City's Patrick Mahomes weren't behind center last season and account for 40 of the additional 100 passing touchdowns. Five teams are a combined plus-77 in touchdown pass differential from last season, and all five are more than 10 touchdown passes ahead of their 2017 paces. At the other end, no team's passing offense has suffered more than a 10-touchdown reduction from last year. Four of the five biggest gainers from last season have new quarterbacks, new playcallers or both, most notably the Colts, Chiefs and Bears. This season's offensive numbers have proved an effective antidote to years of off-field controversies and sinking television ratings for the NFL. Some of it can be attributed to active rule adjustments. Other elements must be seen in context with long-term trends. This much is clear: To the extent that it can, the NFL will ensure those adjustments and trends continue into 2019 and beyond.